Whenever heirloom tomatoes are in season, I jump at the chance to buy them. These type of tomatoes range in color from golden yellow to purplish-black to green and even striped. My favorite, the beefsteak heirloom tomatoes, are sweeter, juicier and have a more succulent flesh than Roma tomatoes or other industrially grown tomatoes. Pair them with creamy, ripe avocados and a peppery cilantro lime dressing and you’ll have an heirloom tomato and avocado salad you’ll fall in love with. Combine all ingredients for dressing (buttermilk - garlic) in a blender and puree until smooth. Season with salt and pepper. Set aside. Peel and thinly shave red onion. Submerge in cold water for 10 minutes to help reduce the strong onion flavor. Drain. Slice tomatoes and avocado. Arrange salad by placing 1 tomato slice on each of 4 plates. Top with sliced avocado and sliced onion. Season with salt and pepper. Repeat layers 3 times ending with avocado. Drizzle dressing on top and serve. Whenever I watch a cooking show showcasing a chef and the way he or she prepares his food, the chef mentions how the ingredient should shine in the dish. If you have a stellar ingredient, you can make a stellar dish. One chef accidentally bought a surplus of asparagus and decided to plan a 12-course menu based on asparagus only to receive rave reviews from critics. Sometimes you don’t even need to do much to the ingredient to make it better, as is shown in this salad. All of the ingredients from the tomatoes to the avocado to the cilantro should be picked at its peak to produce the most flavorful salad. If all of the items are top-notch, the salad should shine on its own. 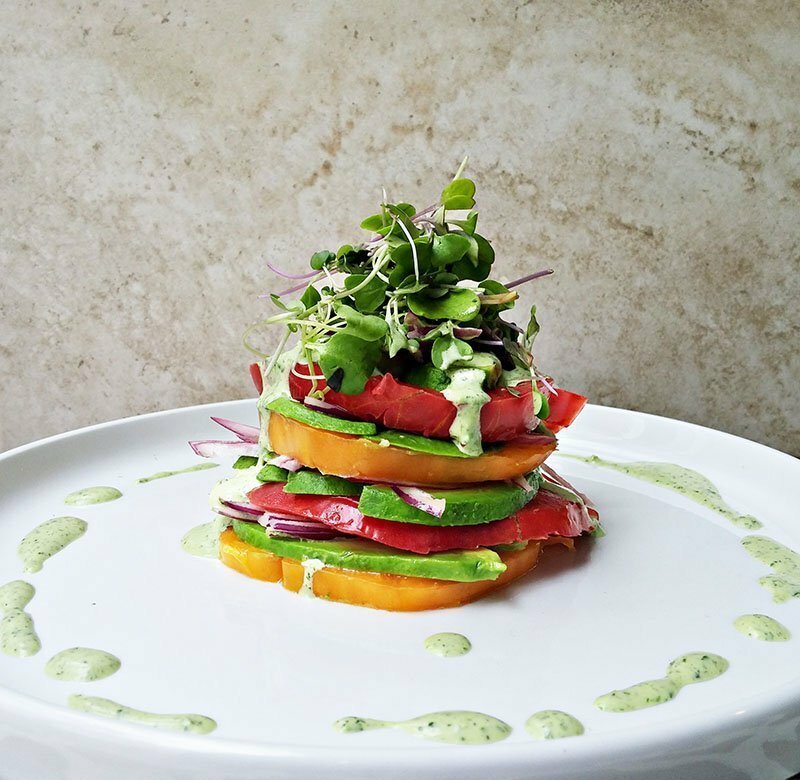 The cilantro lime dressing I paired the heirloom tomato avocado salad with is one of my favorite dressings. I originally made it for portobello fries, and have since paired it with corn fritters, stuffed mushroom caps, and now this salad. It is incredibly versatile and just darn delicious! I did make some modifications to the aioli to make it more of a dressing for this dish. A little buttermilk, yogurt in lieu of mayo, fresh limes and cilantro create a salad dressing you’ll want to add to many of your dishes. 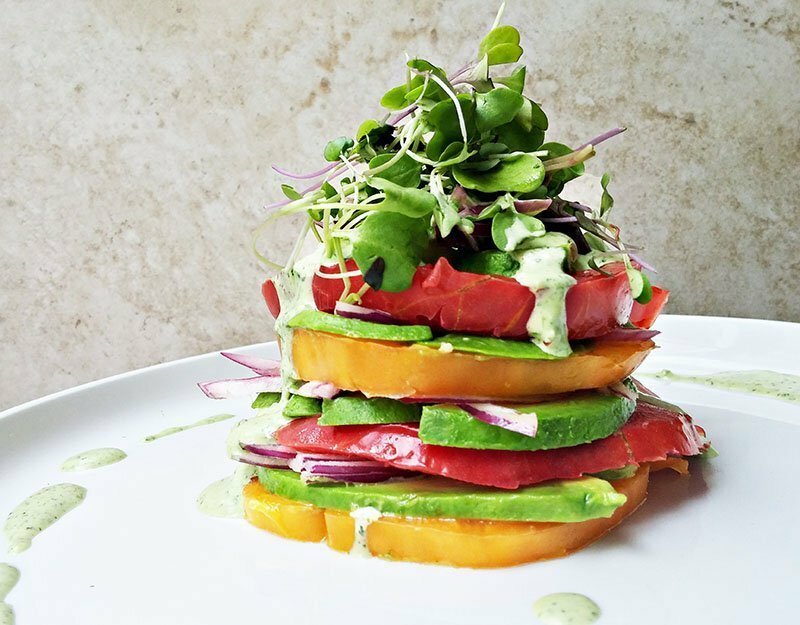 I have to say, this heirloom tomato and avocado salad was exactly what I was looking for. Even my man, who only eats salad if it’s drenched in ranch, enjoyed this dish! That, my friend, is a true testament to how delicious this is!